All we have to pay for is the shipping, which has gone up a bit but altogether it is a great deal. Oh, they don’t just offer free business cards. They also offer free magnets, calendars, etc… so look for their “free products” tab. This entry was posted in My 2 Cents and tagged business, cards, free on February 27, 2009 by a8le. I needed an easy way to copy or move files from one directory to its parent directory, but couldn’t find a feasible way of doing it. However, along the way I found a very useful XP / Vista tweak. This tweak allows us to copy or move files to other directories using a directory browser… via right click. Many thanks to The Geek. This entry was posted in Sys. Admin and tagged copy, files, move, right click on February 26, 2009 by a8le. I found this book to be informative, easy to comprehend, and practical. It is short and to the point. The ideologies presented are profoundly interesting. Along with the Law of Attraction, Mr. Losier briefly mentions NLP (Neuro Linguistic Programming). And how they can be used to change and shape our lives. Keep your mind on the goal and don’t let anything make you doubt yourself. Have a positive attitude at everything you want, stay confident. The cup is half full, fill it up… it’s not half empty. Surround yourself: with things you value, positives, people that are in tune with your wants. As previously mentioned, I have always had a positive outlook on everything, therefore the Law of Attraction was not something that was extremely radical or new to me. It was just a different way of viewing things. However, I did come to the realization that when I changed the exercises around a little, they were helpful in shaping the ways in which my children think and view life… you know how kids are always questioning if they are doing things correctly… diffidence. Anyways, for those of you out there that need a little reminder or motivation on how you should think when you have a goal in mind then this is book is a “must read.” But on a general basis, this book is a “should read.” It brings up very interesting topics… some of which are denounced by the scientific community. 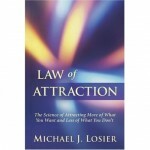 This entry was posted in Book Review and tagged law of attraction on February 2, 2009 by a8le.